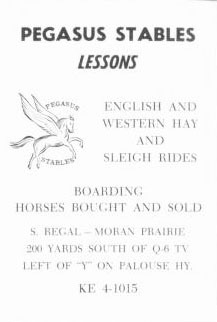 Lessons - English and Western. Hay and Sleigh Rides. Boarding. Horses bought and sold. 200 yards south of Q-6 TV. Left of "Y" on Palouse Hy. KE 4-1015.